This 6" x 8" tile by Motawi Tileworks is based on Motawi's 2010 ArtPrize Mural. 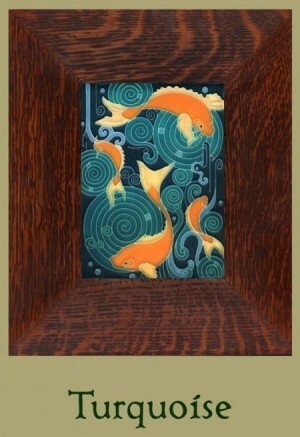 This elegant tile captures the movement of Koi swimming in a swirling pond. Shown here framed in our own handmade quartersawn white oak 3" wide Legacy style frame; hand selected to ensure the best finish, with a slight bevel to the molding to draw attention to the tile. Pictured with our Signature stain color, the Legacy framed tile measures 11.5" w x 13.5" high. Also available in our 2" wide Oak Park mitered frame, or unframed. AND NOW FROM DARD HUNTER STUDIOS: Select one of 3 color choices for our hand applied finish at no additional charge!